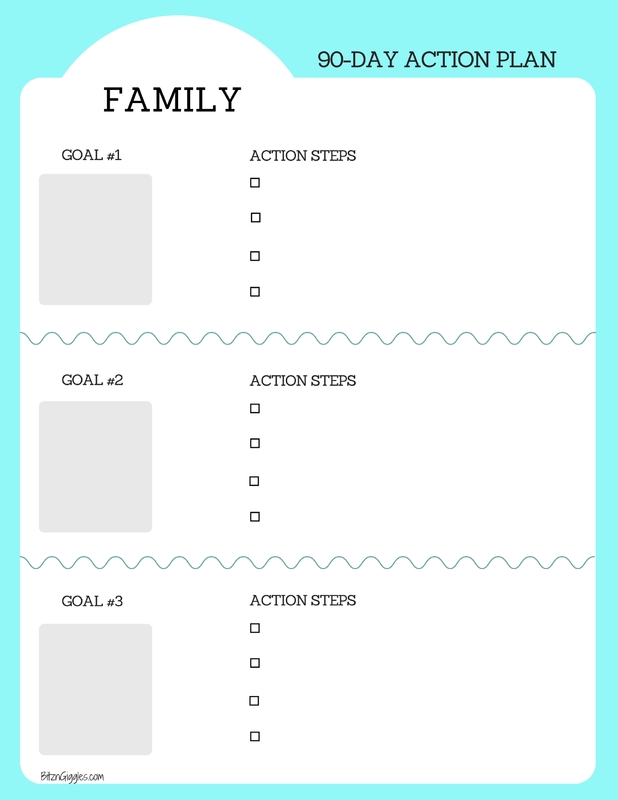 Family Goal Setting Printable – Free 90-day action plan printable to help your family set manageable goals you can work together to achieve. This is a sponsored post written by me on behalf of General Mills. All opinions are 100% mine. The start of a new year always feels good. It’s a time when many of us start to think about new beginnings and all of the things we want to accomplish. 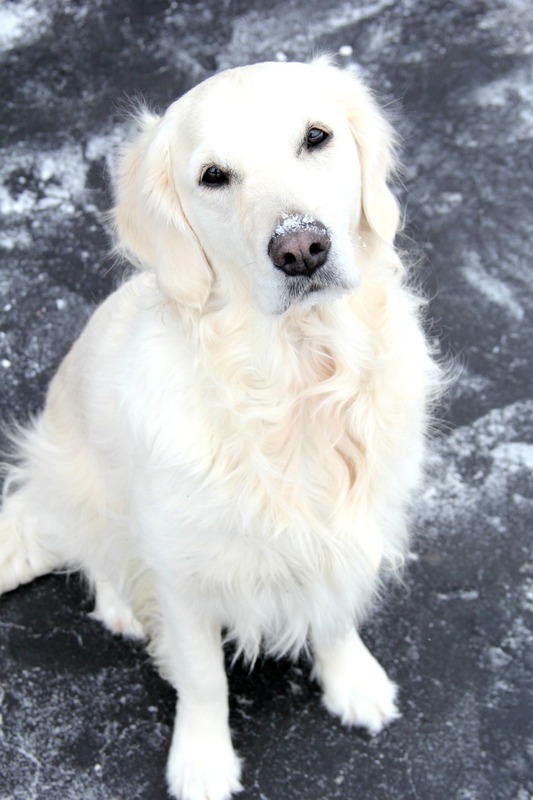 I’ve never had good luck keeping “resolutions.” Have you? I’ve learned over the years that setting goals is the way to go. Each year I set goals in my professional life, my personal life and my family life. What I’ve found is that for our family, 90-day goals work best. We’ve found that breaking something BIG into manageable “chunks” is so much easier. Ninety days is long enough to make meaningful progress and short enough to be able to stay focused. 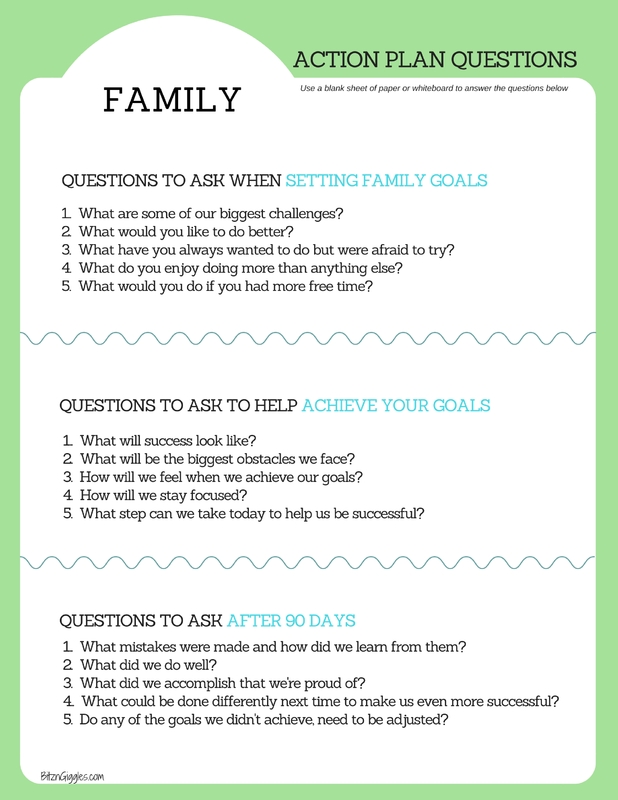 Today I’m sharing a goal-setting printable to get you and your family started on creating your own 90-day action plan. Get your family together, grab a blank sheet of paper or whiteboard and start going through the first set of questions on the printable. This is the time to brainstorm, reflect, engage and listen. For example, when our family talked about our biggest challenges, one of the things that came out of that discussion was how hectic our mornings can sometimes be – rushing around, making sure backpacks are ready to go and trying to fit in a quick breakfast before heading out the door to catch the bus. We decided that this year, we want to be less tired, more organized and have enough time to sit down for a decent breakfast before heading out the door. That idea was then captured in our action plan. 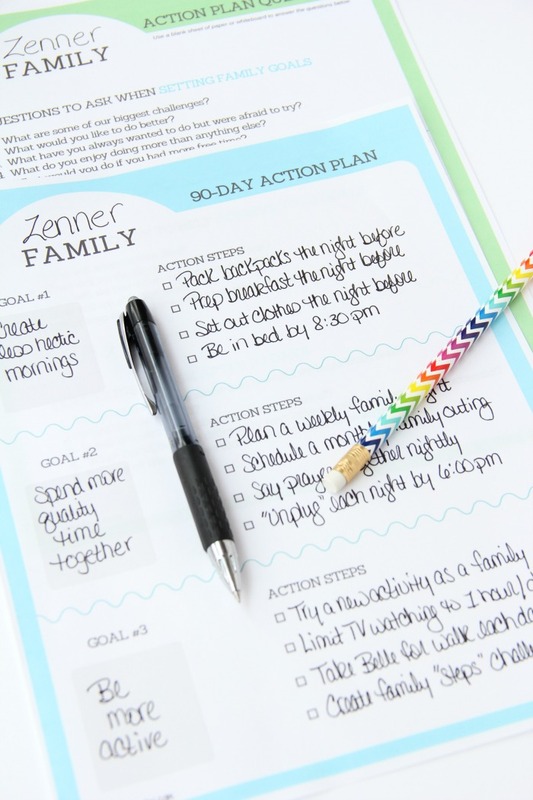 Your 90-day action plan should feature 2-3 goals your family wants to achieve that came out of the previous action plan discussion along with 3-4 action steps for each of those goals. Let’s use the hectic morning example again. For our family, our goal was to create less hectic mornings. Our other two goals included spending more quality time together and being more active as a family. Each of those goals had their own set of action steps as well. After you’ve put together your action plan, it’s time to execute! Review the second set of questions on the green Action Plan Questions printable. These questions are meant to inspire and help you accomplish what you’ve set out to do. It’s so important that you stay focused and keep your action plan top-of-mind. 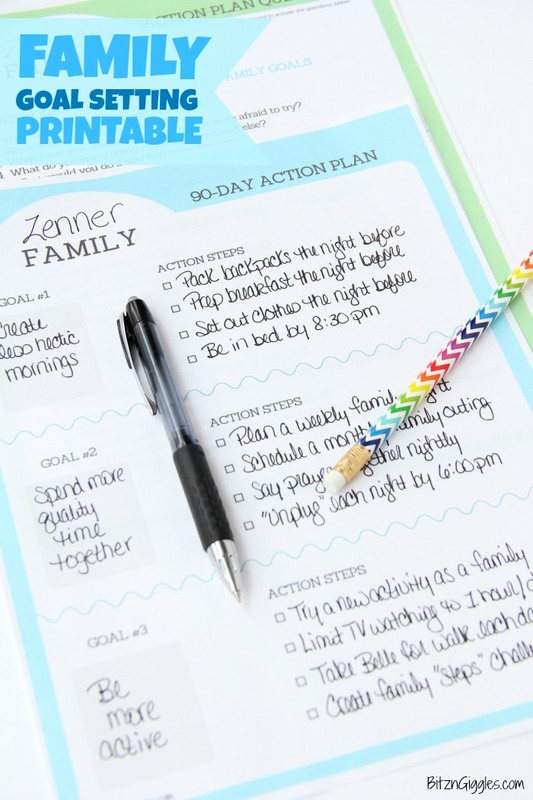 Display your action plan where the whole family can see it. We usually post ours on the fridge so we see it multiple times per day. So, are you wondering how we’re doing? We’re actually doing really well. Our mornings really ARE less hectic and some days we actually feel like we have EXTRA time. Since we’ve been prepping things the night before, everything we need in the morning is ready to go. We know what we’re going to wear, we know what we’re going to eat. The bowls, spoons and cereal are already out on the table, and the kids can help themselves. Our family loves the NEW General Mills cereals at Walmart. The Banana Nut Cheerios are our favorite. There are no artificial flavors or colors and we’re pretty crazy about the taste – it’s a combination of real banana puree, cinnamon spice and oats. Yum! We often slice up a banana and throw that in there too for an extra boost in the morning. So, once 90 days has passed, it’s time to reflect on how you did. Grab the green Action Plan Questions printable again, and this time, focus on the third set of questions. Discuss where may you have stumbled, where you succeeded, what could you have done differently, and so on. Every three months, work on your action plan – change or adjust your goals, create some new action steps. Maybe your next goal is a family vacation! Create some action steps on how to get there. They could include researching specific destinations, saving money, setting dates, etc. You are allowed to DREAM! Your goals SHOULD be lofty. They should even seem a bit out of reach. I promise you that you will be shocked at what you can accomplish if you stick to your plan. 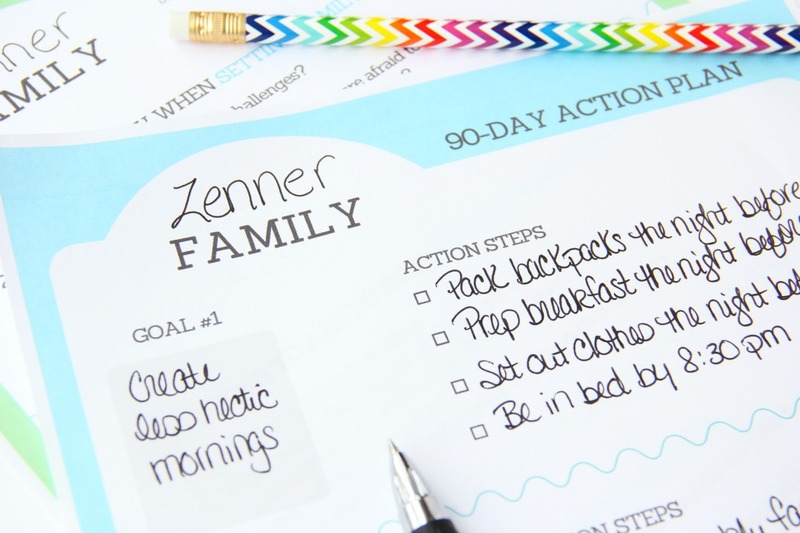 I challenge you and your family to create your own 90-day action plans this year. I would love for you to share some of your family goals in the comments. Good luck, and make it a truly awesome and awe-inspiring year! 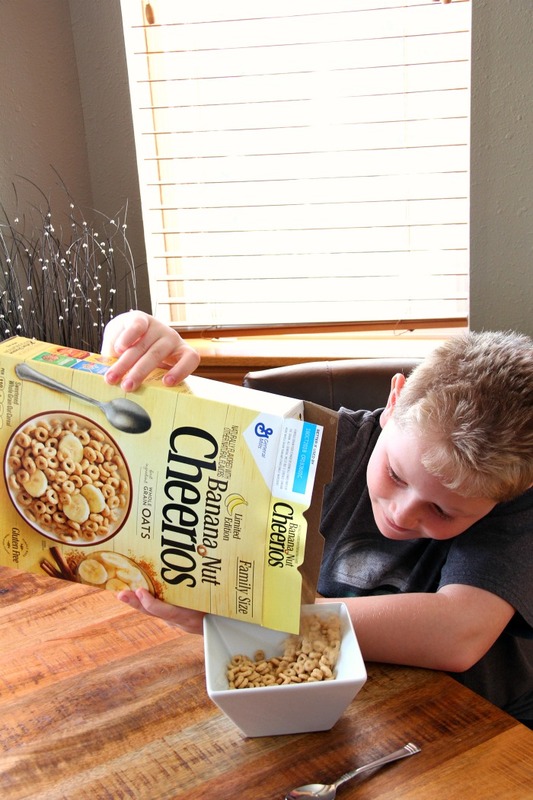 Shop for Banana Nut Cheerios and other General Mills cereals on Walmart.com! And while you’re at it, if you buy 5 items, scan your receipt with the Box Tops Bonus App and earn 50 Bonus Box Tops! Help earn cash for your child’s school!